In the throes of cancer treatment, one Destiny player finally got the help that he needed to make it to the Lighthouse. After his death, the community came together for his family in an amazing way. Mike was a dedicated player, logging over 2,800 hours and playing all three classes, but he wasn’t skilled enough to make it to the the prestigious Lighthouse. The Lighthouse is an area in Destiny that can only be reached when a player has a flawless victory, meaning nine wins and zero losses, during the PvP event Trials of Osiris. As Mike’s health started to decline, it was getting harder for him to play Destiny. Still, Tim knew how much it would mean to him to get to the Lighthouse, and they wanted to find a way to get him there before time ran out. They decided to enlist outside help. 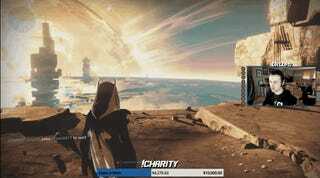 During Lupo’s 24 hour charity stream for the Make A Wish Foundation, Mike finally made it to the Lighthouse. Mike, for his part, sounds at ease and happy when the moment finally arrives, even when detailing the state of his disease. Just before they ascend to the Lighthouse, someone asks him what he’s going through, and he says that while he had been diagnosed with colon cancer eight months prior, he had recently learned that it had spread to his liver and his brain. But there’s nothing in his voice that indicates how severe his condition is. He hadn’t had a chance to play Destiny recently because he had been recovering from surgery. He’s just happy to be playing again, with his friends. According to Tim, Mike never thought of cancer as a major obstacle. “He thought it was just another hurdle to jump and he’d be back working a normal job like the rest of us,” he said. Unfortunately, a week ago, Mike passed away. Eventually, Lupo got in contact with Mike’s family, who passed on a memorial fund for him, with a goal of $5,000. Within a day of posting that link, the Destiny community surpassed that goal. The family raised it to $7,500, and the community has helped them reach that goal as well.